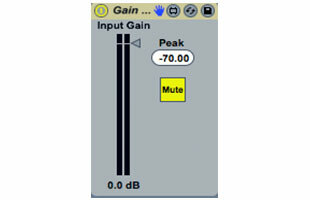 This is a Gain Utility I created using max for live. Personally I prefer to not use automation on my track faders and since the standard utility only goes to -35DB I created this Free Max For Live Utility patch to be able to automate full fade outs. I also smoothed the mute button so as to avoid those click noises that can happen when using Live’s Track Activator button (Mute). Another added benefit of this Free Max For Live Utility is the VU meeter and the resettable Peak meter. I really like using Ableton Live’s Racks but some times i miss the the VU meter that can be seen in between devices in Ableton Live. This Max For Live Utility can be effectively used as a VU/Peak meter inside a rack or any where else a gain stage is needed. Feel free to make any modifications and share this device with your friends.